Please note this website is currently undergoing a review - please check back again soon for updated content. IThe European Union of Women celebrated its 60th anniversary in 2013. It was founded in Salzburg by Austrian MP Dr Lola Solar with the aim of enabling women to contribute to international debate and to stimulate interest in European affairs. Today there are 17 countries in membership. The European Union of Women (EUW) has consultative status with the Council of Europe and Special Consultative Status with the Economic and Social Council of the United Nations (Ecosoc). It also contributes to the work of the European Parliament through the EPP Women’s Section and national MEPs. Over the past 60+ years, the role of women has changed and so has the EUW. The EUW now also helps women – across the continent - to take an active part in political and civic life. It helps women in emerging democracies play a role in the development of their nations from the outset. Through the EUW's six commissions, research work into issues of today and, more importantly, tomorrow are carried out and the results fed into various national and international bodies. The work has a unique flavour as it pulls together experience and thought provoking results from women throughout Europe who are centre-right in political thinking. The Human Rights Commission, for example, attracts lawyers from all member states. Europe Alive Commission, in comparison, organises cultural, economic and political visits, usually lasting 3-4 days, to member states and is open to all in membership of the EUW. EUW’s individual members include elected representatives of national and European parliaments, businesswomen and professional women from all walks of life. Each member country has its own vibrant section which you can join - see your country page on this web site. The EUW works for the strengthening of peace on the basis of justice and the free cooperation of peoples. The European Union of Women stands for the safeguarding of human dignity and freedom, the maintenance of Europe’s outstanding cultural heritage, and for social and economic progress while protecting the rights of the individual. The Czech Republic joined EUW in 2015. 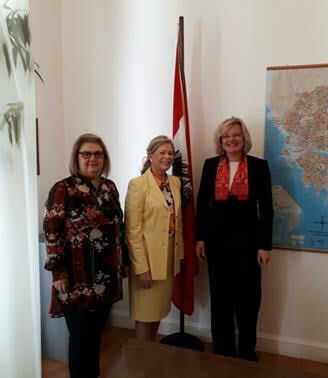 The Polish Section has entered its 21st year of membership of the EUW..
On 12 April the former Federal Minister Dr. Sonja Stiegelbauer (in the middle of the photo), the President of the Austrian Section of the European Union of Women (EUW) with her husband as well as the President of the Greek Section of the EUW Aphrodite Bletas (in the left of the photo) visited Ambassador Andrea Ikić-Böhm. EUW was established in Austria in 1953, when the Austrian MP Dr. Lola Solar, founded this association in Salzburg in order to promote peace and economic growth in Europe based upon friendly relations within a women's network. Currently, the EUW comprises 17 members (nations). The EUW has a consultative status at the Council of Europe and a special adviser status at the Economic and Social Council of the United Nations (ECOSOC). I wish to express my sincere condolences on the sad massacre of 14 July to the French people. Our European values are all jeopardised through such events of horror. The best way forward now is for the EU, in accordance with its best traditions, to work together with the UK government to obtain the most acceptable outcome for the citizens of the UK and Europe. In the morning is a conference: Education and Secularism organised by the French Section. From 8:30 to 12:30 at the French Senate.